Fly to the Grand Canyon's West Rim by helicopter, enjoy a champagne picnic, then cruise the Colorado River. This is a half-day tour, leaving you with time in the day free to explore Las Vegas and Nevada at your leisure. Your helicopter flight will take you soaring above the mighty Hoover Dam and extinct volcanoes. You'll then descend 4,000 feet (1,200 meters) below the rim to land along side the Colorado River, where you'll sip on champagne and enjoy a light picnic lunch. 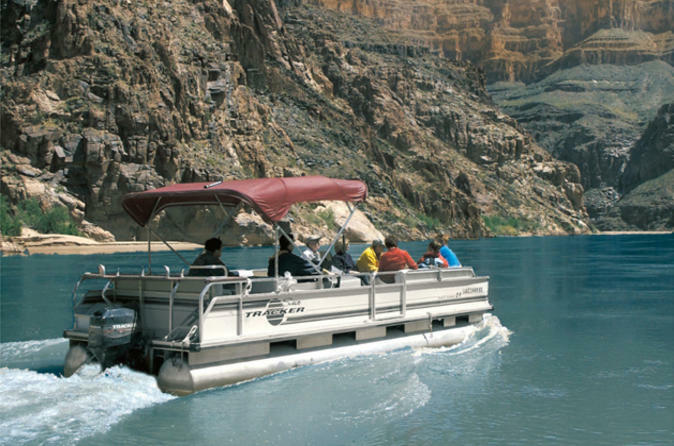 Then continue your adventure with a 15-minute pontoon boat ride on the mighty Colorado River for a close-up view of these world-famous geological formations. Your return helicopter flight along the Grand Canyon and the north shore of Lake Mead is completed with an exhilarating flight over the Las Vegas Strip. On landing, your limousine is waiting to whisk you back to your hotel.